The pace of technological change is accelerating, hyper competition is growing, opportunities for business model disruption are exploding, and comprehensive cloud delivery is readily available. These factors challenge every aspect of business technology strategy. 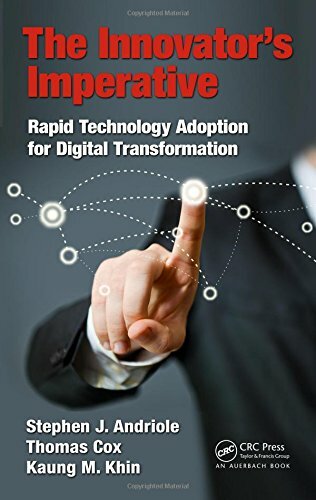 The Innovator’s Imperative: Rapid Technology Adoption for Digital Transformation prepares twenty-first century businesses leaders for competing and leading in this disruptive digital environment. All companies wanting to be competitive should adopt emerging and disruptive technologies as quickly as possible, and in many cases, immediately. The book explains each of these steps to guide business leaders in architecting digital transformation projects according to their organization’s market positions, budgets, objectives, and corporate culture. Hyper-competitive, disruptive companies are jumping across technology adoption phases without regard to any phasing whatsoever. Companies focused on digital transformation often adopt emerging technologies immediately. They have become early adopters of technologies that can impact existing―and create whole new―business models and processes. This book examines this jump into new technologies, processes, and business models to prepare twenty-first century business leaders to make that leap.